Chevron Edge has all the easy-to-use, versatile appeal of Simple Edge but with an added zigzag border to jazz up the look. 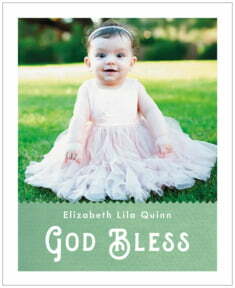 Beautifully varied hues of color on a soft woven texture set the stage for your images and text. Most shapes in this style feature a prominent space for your own uploaded photos or artwork. With over twenty background colors and eleven fonts to choose from, you're sure to find one that makes your image and words look fabulous. Personalizing your labels, tags, coasters, invitations and more is a breeze with Chevron Edge. 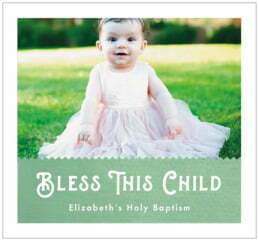 Customize your Chevron Edge baptism labels today! 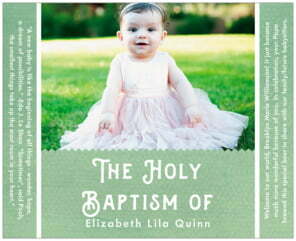 Evermine Chevron Edge baptism labels are printed on your choice of coated paper or waterproof vinyl label stock. Both print with fine detail and the light colors are soft and gentle, while the bright colors are luscious and juicy. The labels are easy to apply. In the case of the vinyl option, the Baptism labels are also very easy to remove, and the square shapes are even re-usable. Just peel them off, starting at a corner, and then pull slowly to save them for another time. 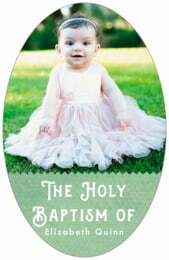 Baptism labels come in many different shapes and sizes to allow them to be used in many different ways. 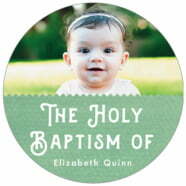 To get started just choose a shape from above and then select "Personalize" to create your Chevron Edge baptism labels.